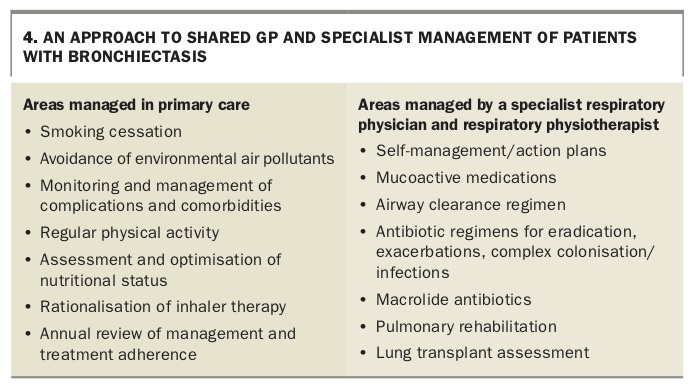 Developing an appropriate management plan requires application of robust primary care principles as well as engagement of a specialist multidisciplinary team experienced in the management of non-CF bronchiectasis (Box 4). All patients diagnosed with challenging bronchiectasis should be referred to a respiratory physician and a physiotherapist experienced in airway clearance techniques for assessment, which may assist in confirming the diagnosis, disease severity, comorbidities and complications and in further developing management and self-management plans. Management plans need to be individualised, tailored to patient preference and reviewed on an annual basis. In common with asthma, a significant proportion of patients with bronchiectasis have bronchodilator reversibility (15 to 36%) and evidence of ongoing inflammation.27,28 Asthma remains common and bronchodilators should be prescribed for empirical trial in true cases of asthma. 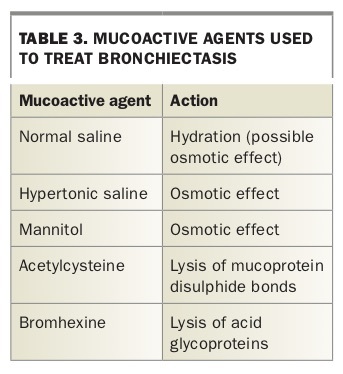 Bronchodilators can also be used effectively before mucoactive therapy and airway clearance, although in the absence of bronchodilator reversibility and subjective benefit there is little evidence of benefit in routine use. Inhaled corticosteroids are frequently used in patients with bronchiectasis yet their benefit is far from certain. Meta-analysis suggests they have no significant beneficial effect on lung function, exacerbation frequency or quality of life and therefore should not be prescribed for bronchiectasis.29 Furthermore, inhaled corticosteroids in those with chronic respiratory conditions can increase the risk of nontuberculous mycobacterium infections, highlighting the care needed when deciding to prescribe them for patients with bronchiectasis.30 Inhaled corticosteroids may be indicated in the reasonably large proportion of patients with bronchiectasis who have concomitant airways disease (COPD or asthma). In the absence of these co-diagnoses, active efforts should be made to withdraw or titrate inhaled corticosteroid use if already commenced. Mucoactive agents provide mucolysis, mucokinesis and augmented expectoration. Mucoactive therapies are aimed at improving mucus quality by changing the physiochemical properties of mucus, reducing tenacity and improving flow characteristics, thereby improving mucociliary clearance. Some agents are listed in Table 3. Mucoactive therapies have been largely proven to be effective in treating CF but there is little evidence for their effectiveness in non-CF bronchiectasis. Important differences exist between CF and non-CF bronchiectasis. These are perhaps best exemplified by the mucolytic agent dornase alfa (recombinant human DNase), which is widely used and effective in CF but has been shown to be ineffective and possibly detrimental in non-CF bronchiectasis. Evidence of a drug’s efficacy in non-CF bronchiectasis is therefore needed, rather than making assumptions about its efficacy based on the CF literature and experience. Nebulised short-acting beta-2-agonist bronchodilators have been shown to improve sputum volume production and may be a useful adjunct to mucoactive treatment. Both inhaled mannitol and hypertonic saline may cause bronchoconstriction, so a monitored test dose is required at first use, with measurement of FEV1 before and after nebulisation. Mucoactive therapy regimens usually need to be implemented, reviewed and revised after two to three months. The expertise of experienced physiotherapists is invaluable in this regard.